Since its inception in 2011, the BCom Case Competition - colloquially known as BComp has seen remarkable growth. More students registered for the 2017 BCom Case Competition than ever before! BComp is a campus based competition designed to complement the international case competition program, providing a greater number of students the opportunity to participate and develop case competition skills. 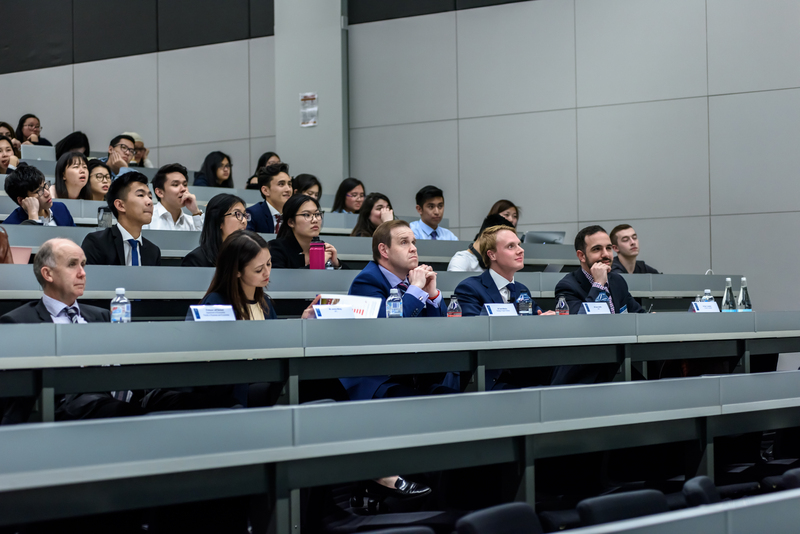 It offers an opportunity for students to test their business case solving skills, receive training from and network with corporate sponsors and get hands-on experience as a management consultant.After a hiatus in 2016 while the Faculty of Business and Economics hosted the Australian Undergraduate Business Case Competition, an international case competition which welcomed students from 16 leading universities across the globe. Eager for a chance to work on a real-life business case after a year’s break, a record-breaking 440 students registered for the 2017 BCom Case Competition. The first round saw teams attempt the selection case on how Myer should best respond to the entrance of Amazon to the Australian retail industry. After a whole weekend of marking, the BCom Case Competition student committee – led by BCom students and International Case Competition representatives, Will Kent and Ava Roshan – invited the top 15 teams to a Crack the Case Workshop delivered by Principal Partner, Strategic Project Partners (SPP). Fully equipped to crack a case, the top 15 teams walked away with less than two days to prepare for their final case on the NAB Australian Football League Women’s Competition (NAB AFLW). Paul Wiseman, Management Consulting Subject Coordinator, prepared a challenging case for participants, who were tasked with providing a set of recommendations to achieve $10 million in revenue within three to five years. Creativity was crucial, as revenue streams available to the AFL Men’s competition were off limits, such as revenue from television rights and ticketing of games. Teams proved they were up to the challenge, presenting to panels of judges after a weekend of mentoring and preparation. The top three teams progressed to the final round, with DB Consulting taking out first place, closely followed by Kensington Advisory and Wow Such Team in second and third place respectively. The top three teams receive a share in $5,000, a guaranteed interview for SPP’s Graduate/Internship Programs, and a guaranteed interview for the International Case Competition. DB Consulting (Farah Aiman Ahmad Razif, Bryan Chaw, Jordan Zheng and Christina Loccisano) first met each other during the Global Management Consulting subject at Deutsche Bank in Berlin earlier this year. Student Coordinators, BCom Case Competition 2017: Front row (L to R): Will Kent, Ava Roshan, Tom Peyton. Back row (L to R): Aleisha Hall, Kourosh Keshavarz, Ariana Dendrinos, Kate Hesse. 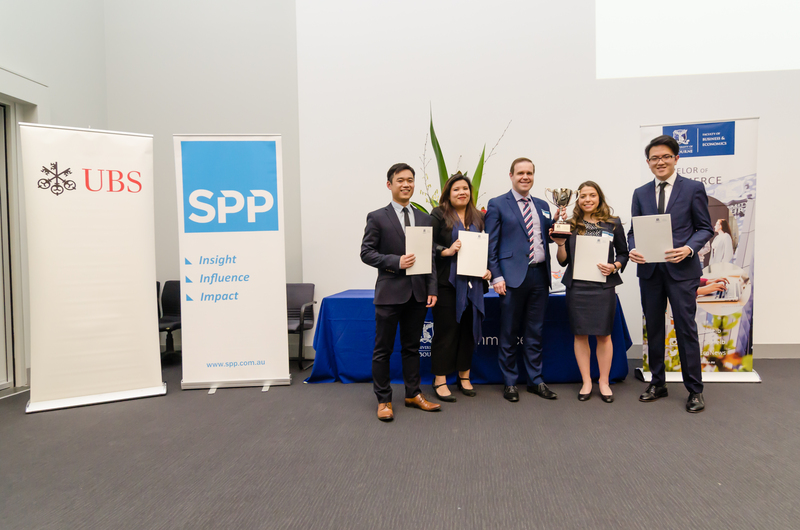 The Faculty of Business and Economics would like to thank SPP (Principal Partner), UBS (Major Partner), Market Lane Coffee (Local Business Partner), AFLW (case contributor) and all competition judges for their support of the 2017 BCom Case Competition.